Canoga Perkins is a privately held, U.S. based business that has been in the industry for over three decades. We have over 1,000,000 products installed in networks around the world. Our company delivered the world’s first commercially available single mode LAN extension system in 1986, and we have remained a pioneer in fiber optic and WDM technologies since then. 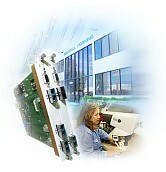 Canoga Perkins designs and manufactures specialty optical transport products for the telecommunications industry. We are product and applications experts in the niche markets that we serve, partnering with our customers to deliver real-world solutions that are practical, cost-effective and reliable. We provide the products of choice for Service Providers, and for Military and Government applications where fiber optic extension and optimal high speed bandwidth are required. Canoga Perkins is proud to maintain the highest standards in Product Quality, Business Standards, Customer Interaction, Testing, Certification and Ethernet Performance Validation.